Symphytum officinale leaves and roots are infused in an olive oil base for at least one month. 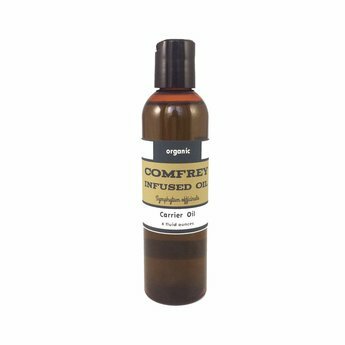 We make our Comfrey infused oil in small batches and add a touch of Vitamin E to guarantee freshness. Comfrey is the ultimate tissue-healing herbal tool. It has a high content of allantoin, a phytochemical that promotes new skin cell growth and reduces inflammation. As a demulcent, comfrey also is deeply soothing for irritated skin conditions. Consider this oil in any tissue-healing preparation. It is deep green in color and will tint any products it is added to. Keep cool and out of direct sunlight. Shelf life should be about 1 year. For external use only! Do not use on open wounds. Not for use by women who are pregnant or breastfeeding. Only use in diluted form (i.e. as an ingredient). Do not use for prolonged periods of time.